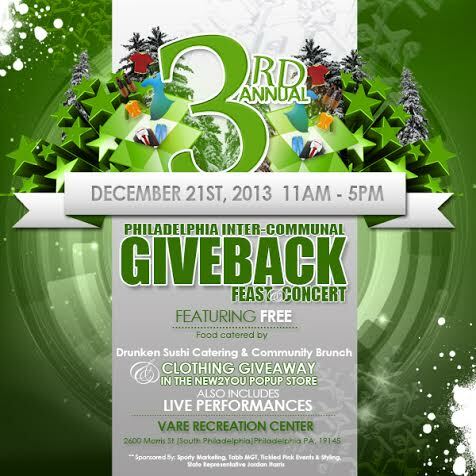 This Saturday the 3rd Annual Philadelphia Inter-Communal Giveback Feast & Concert is set to take place at Vare Recreation Center in South Philadelphia. The FREE event travels to different under-served Philadelphia communities each year. It provides gently-used clothing and non-perishable food items for families in need, and a feast and concert for the community. Last year, I had the pleasure of hosting and covering The Giveback at the Cecil B. Moore Recreation Center in North Philadelphia. Click here to read the SS on the Scene write-up. Looking for an opportunity to spread holiday cheer? Stop by to drop off gently-used clothing, non-perishable food & cash donations for families in need!